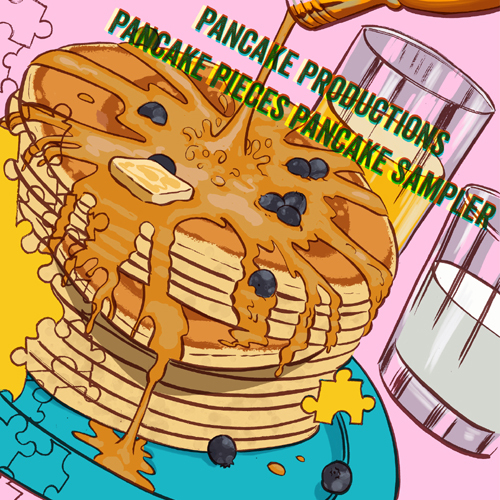 I started putting out the call for songs and other recorded pieces about Pancakes in the first half of MMXV sometime. By late September, I had collected no fewer than FIFTY tracks. This compilation was released to coincide with PancakeFesten X, the pancake-party and weekend-long acoustic-music festival to celebrate my living at the current PPHQ for TEN YEARS. Bobby Stevens - "Breakfast In Bed"
Old Scratch's Burn Pile - "A Sizzling Love Affair"
Nicholas Naioti - "The Pancake Man"
Davey Dynamite - "Silver Dollar"
Magnus Honey - "Flip It"
Monsters Everywhere - "Pancakes Made Of Gold"
Matt Harnish's Pink Guitar - "International Church Of Pancakes"
The Vanilla Beans - "Pancakes Are Beautiful"
Misung And The Keyboards - "Pancake Ache"
Ben Diesel - "Booze For Breakfast"
Shark Dad - "Bisquick Man"
Superfun Yeah Yeah Rocketship - "Pancake Me U.S.A."
Bassamp & Dano - "She's Got Flapjacks"
Zak Marmalefsky - "A Funny Sandwich"
Popular Mechanics - "This World Is Flat (As A Pancake)"
Curt Oren - "Instructions On How To Become A Pancake Master"
The Ottomen - "King Of Pancake Town"
Seaby & The Rules - "A Buttersworth A Thousand Words"
Josef Steinman - "Pancakes, Pancakes, Yum Yum Yum"
Old School Neon Dinosaurs - "Hip Hop Cakes"
Belly Belt & Coolzey - "8 To 10"
Syna So Pro - "For The Pancakes"
Dubb Nubb - "Pancakes And Coffee And No Bad Days"
WHSKY JANETOR - "Uncle Bill's Pancake House"
Little Ruckus - "Hi RØB It's Me, Dom"
Cody Mitchell - "It's Breakfast"
Donnie Bobb - "Pancake Breakfast"
Mario Viele - "The Buttery"
Mark Cooper - "Breakfast Of Champions"
Beefaroni Blorps - "Gooey Batter"
Jeffy Louise McSmecklinberg - "Pancaker"
Lord Of The Yum-Yum - "Van Lear Woods Premium Maple Syrup Commercial"
Mammalmusic - "Power Of Pancakes"
Carondelet Guy - "Don't Have A Cow, Man"
Miss Molly Simms - "Pancakes And Cigarettes"
DREAMFATHER - "Pumpkin Patch Pancakes"
Whoa Thunder - "Master P (Theme From Pancake Master)"
Skarekrau Radio - "Pancake Master"
American Girl Reporter - Pancake Promo"
Thanks everybody for contributing cool songs about pancakes just for this compilation. By my count there are 15 Saint Louis acts on Disc 01 and 14 Saint Louis acts on Disc 02, so technically speaking this is a mostly-local compilation, but JUST BARELY, really. It's practically half-full of outta-town acts! Umm this thing will be on the Pancake Productions BandCamp pretty soon; probably by the time you read this in fact. and let's work it out!